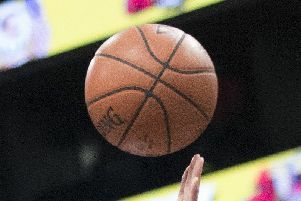 City of Edinburgh Kings joined a four-way tie at the top of the Scottish Basketball League after beating local rivals Edinburgh Lions at Portobello High School. The outcome was practically decided in the opening ten minutes as a youthful Kings line-up raced 20 points clear by the end of the first quarter. Lions lost by 48 to champions St Mirren last week and must have feared another mauling when they trailed Kings 66-30, but a late flurry enabled them to escape with a more respectable 72-50 defeat. Rory Milne – last week’s matchwinner against Stirling – led the Kings scorers with 30 points. Kings, St Mirren, Falkirk Fury and Dunfermline Reign have all won eight league games this season, and although Dunfermline are the only unbeaten team, Kings will hope to change that when they travel to Fife this Saturday. 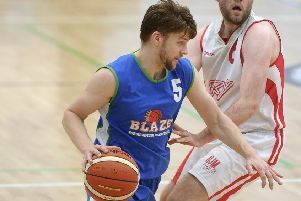 Boroughmuir Blaze fell further behind the leading quartet when they went down 89-75 to Falkirk at Grangemouth Sports Complex. They were still just about in touch, 11 points adrift, entering the final quarter, but there was no miraculous comeback from the visitors. Edinburgh University’s long wait for their first win of the season goes on following back-to-back defeats to title-chasing St Mirren on Friday and Sunday. Part one in Paisley finished 108-54, but the students salvaged some pride in the return fixture at The Pleasance where they lost 83-55. In the women’s league, reigning champions City of Edinburgh Kool Kats emerged from a two-week break to crush West Lothian Wolves 90-30 at Portobello High. Leanne Page outscored Wolves on her own, racking up 33 points, with Casey Morrison and Tracey Phillips both adding 15. The result saw Kats edge closer to leaders Lady Rocks, who had no game at the weekend, and it sets the scene perfectly for Friday night’s top-of-the-table clash with Rocks in Cumbernauld. St Mirren are also in title contention following their 79-62 victory over Scottish Cup holders Edinburgh University in Paisley. Meanwhile, Caledonia Pride endured a traumatic weekend in their first outings in three weeks. Saturday’s WBBL Cup quarter-final against high-flying Sheffield Hatters was a daunting one for the Capital club and last season’s runners-up were always on the back foot as they bowed out 95-74 in Portobello. Barely 21 hours later, having left Edinburgh at 5.30am, Pride made a bright start at Leicester Arena before the local side rallied and went on to win 93-68.